In many cases, coupling technologies can offer greater potential for success for contaminated site remediation. When combined with clearly defined remedial objectives and performance monitoring to optimize treatment, combined remedies can result in site closure to residential standards within a reasonable time frame. With over 20 years of experience addressing contaminated sites, we have found that not only is coupling of several technologies typically required to reach site closure, and in some cases coupling of what are perceived to be antagonistic technologies (e.g., ISCO and ISCR) provide effective remedial solutions. We have featured several case studies that outline our success utilizing combined technologies to reach site closure or site-specific treatment goals. Many of these projects include additional initial remedial efforts, such as excavation, but contaminant concentrations at the time of our involvement were still considered “source” or within NAPL levels. The case studies include combinations of ISCO with novel combinations of oxidants, ISCO and ISCR, and ISCO and anaerobic bioremediation. We continue to recommend and develop combined remedies to ensure efficient and cost-effective remediation treatment programs. Site Description: A former chemical plant was demolished and the property has laid dormant for two decades in an economically-depressed area in central New Jersey. The primary area of concern was over 3 acres in size and heavily impacted with a range of contaminants, including DNAPL. Contaminants: Soil and groundwater in part of the site were impacted with VOCs (primarily chlorobenzene, carbon tetrachloride and its breakdown products, including DNAPL) and pesticides. Remedial Challenge: The suite of contaminants present included compounds that can only be oxidized (e.g., chlorobenzene) and compounds that can only be reduced (e.g., carbon tetrachloride). Groundwater was shallow throughout much of the site and the DNAPL existed above and within an organic layer. Remedial Approach: We applied sodium permanganate in order to precipitate manganese dioxide, which is then followed by injection of hydrogen peroxide. The peroxide reacts with the manganese dioxide and naturally-occurring transition metals to produce superoxide (reductant) and hydroxyl (oxidant) radicals. This project led to Geo-Cleanse receiving U.S. Patent No. 8,556,537 for Manganese-Meditated Redox Processes for Environmental Contaminant Remediation. Site Description: An active electronic manufacturing facility had an on-site TCE handling unit that was active for 10 years. During this time, approximately 1,365 gallons of solvent was released, which created an approximate 16 acre plume in saprolite and bedrock. Contaminants: Primarily TCE at concentrations greater than 200,000 ug/L in the source area with concentrations of 13,000 ug/L at the property boundary. Remedial Challenge: The site challenges included high TCE concentrations, low permeability saprolite, highly transmissive bedrock, low natural attenuation, and a large plume area with limited accessibility (e.g., steep slopes, forest and highway present, off site contamination, etc.). Remedial Approach: We integrated ISCO using potassium permanganate in the source area, with ISCR using zero valent iron barriers in the downgradient plume area. Reagents were injected as high-solids slurries to distribute large reagent volumes effectively within specific and focused target zones in the low-permeability saprolite and a fractured zone in bedrock. 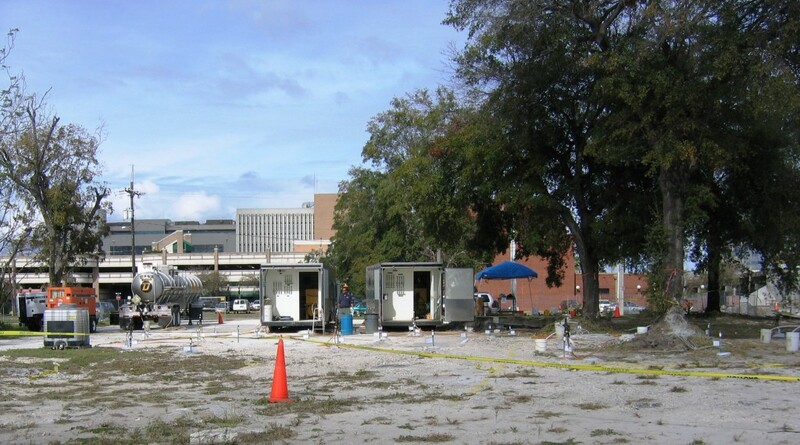 Description: A Brownfield property impacted with chlorinated solvents was the planned location for the home of the Orlando Magic basketball team. Contaminants: Chlorinated solvent contamination was present in soil and groundwater with PCE concentrations greater than 14,000 ug/L and potential presence of DNAPL. Remedial challenge: The City of Orlando was looking to obtain a pay-per-performance contract to complete remediation within a short time frame in order to prevent construction delays for the development. The highest concentration of contamination was present at the top of a basal clay unit, which posed a potential rebound source due to back-diffusion of the PCE. Remedial approach: The remediation treatment program consisted of a “treatment train” approach with the injection of catalyzed hydrogen peroxide for the source, and the injection of sodium permanganate to achieve the cleanup target levels and prevent back-diffusion from the underlying clay aquitard. Site Description: The Naval Submarine Base in Kings Bay, Georgia (a former landfill) was impacted with VOCs due to buried drums. Contaminants: PCE and its degradation products at concentrations of 9,000 ug/L. Based on investigation efforts conducted by the Navy, DNAPL was also suspected. Remedial Challenge: The groundwater plume was moving off site to a residential subdivision, which included 600 homes that used groundwater for irrigation purposes. A pump & treat system was in place, but additional recover wells and an expensive off-gas treatment system would be required to contain the plume. Remedial Approach: We applied catalyzed hydrogen peroxide for source reduction followed by injection of a vegetable oil emulsion to replenish the organic matter. Based on the success of the coupled approach, the pump & treat system was terminated two months after the ISCO, remediation time was lowered from 35 years to 7 years, costs were reduced from $30 million to $5 million and the State of Georgia Chamber of Commerce recognized the project for the State Award of Environmental Excellence. Copyright © 2019 Geo-Cleanse International, Inc. All rights reserved.